OpenMoko is a software distribution stack that sits on top of a hardware platform. The Neo1973 Hardware is the first hardware platform to take advantage of the OpenMoko software distribution. You can find specifics of the Neo1973 Hardware by reviewing this introduction pages and the other Neo1973 Hardware categorized pages below. 64MB Samsung NAND flash (K9F1208U0B) attached to S3C2410 NAND controller. This is the only flash memory in the device. The S3C2410 boots directly from nand, using the S3C2410 Steppingstone. 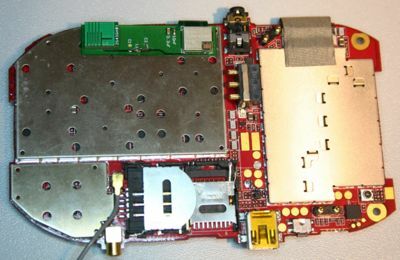 The GSM/GPRS modem is Texas Instruments Calypso based. 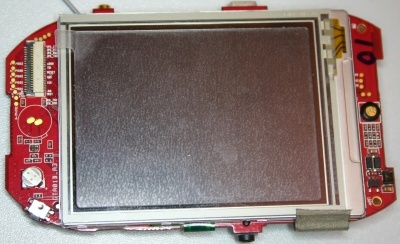 Unfortunately we cannot provide many details on the GSM chipset due to very tight NDAs. However, this is not neccessarily required, since it interfaces using a standard UART serial line with the S3C2410. On that interface, GSM 07.05, GSM 07.10 and other standardized protocols are used. Hammerhead AGPS from Global Locate. This will not have a working driver till at least mid April. The Neo1973 has one microSD aka Transflash slot. It should support SDHC, but this has not been tested. If this works, cards >2G should work with no problems. As there are no microSD cards over 2G at the moment, it hasn't been tested. MicroSD slot is under battery.